The refurbished Early 2014 Macbook Air with large 13.3-inch display is the perfect solution for so many applications. This affordable discount Macbook Air has a powerful Dual Core i5 processor thats great for watching videos and playing games, especially with its sharp 13-inch backlit screen. You can connect all your peripherals with the Thunderbolt and USB 3 ports when youre at your desk, yet it weighs less than three pounds to carry with you. 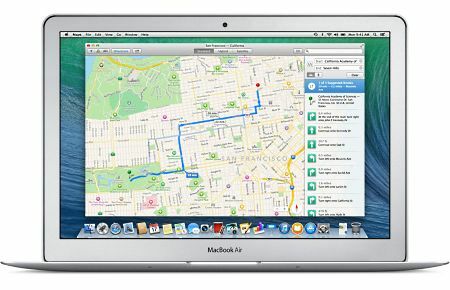 Best of all, the 2014 Macbook Air is bargain priced at GainSaver to fit any budget. When you connect your Thunderbolt devices to your affordable refurbished Macbook Air, youll get things done in a hurry. Data transfer is lightning fast, with speeds up to 10Gbps. With Thunderbolt, you can connect up to six devices at the same time, daisy-chained to the single Thunderbolt port. This makes it super easy to connect and disconnect quickly from all your devices with a single Thunderbolt cable. Just grab and go! Even the two USB 3 ports on the Early 2014 used Macbook Air are faster than before, with speeds up to 5Gbps. But dont worry if you dont have any USB 3 devices just yet. USB 3 supports all of your USB 2 devices as well. You can get around quickly with this ultra portable Macbook Air. But youll be surprised at how much performance is packed inside such a small enclosure. Its powered by a fourth generation Intel Dual Core i5 processor running at 1.4GHz. It even has an Intel HD Graphics 5000 processor that kicks in when you are playing games, watching videos or working on graphics projects. A huge advantage of the fourth generation Core i5 processor is that it is incredibly efficient, meaning it wont drain the battery as fast. Youll be able to do more on less power. Everything about this affordable Macbook Air is fast, even the Wi-Fi connection. The ultrafast 802.11ac gives you speeds up to 3x faster than the earlier 802.11n standard. With the 802.11ac, you can send and receive data at up to 1300Mbps. The result is an online experience youve never had. Web pages appear almost instantaneously. And online games just fly like youve never seen before, everywhere you take your Macbook Air. One thing you ought to consider when you order your 13-inch Macbook Air, is that it would be a shame to let any of that the speed and performance go to waste. If you need to have access to a Windows notebook, you should order your refurbished Macbook Air with the MacOS and Windows pre-installed for you. With its 13-inch screen and high performance processor, this Macbook Air will become the best Windows laptop youve ever used.